Worldwide societal problems such as mass unemployment, growing social disparities, public and private poverty, social exclusion, environmental destruction and the evidence of climate change are increasing and becoming ever more visible. They require urgent and sustainable long-term solutions. 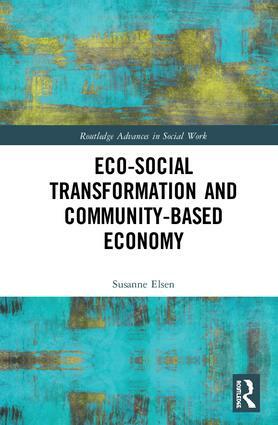 Eco-Social Transformation and Community-Based Economy provides a transdisciplinary conception of community based socially productive approaches to eco-social transformation and sustainability. It introduces interdisciplinary discourses, basic theoretical concepts, participatory and community-based research, development strategies and practical prospects and considers them in the context of both eco-social transformation and eco-social work, especially with disadvantaged groups. With case studies that demonstrate the creative power of local embeddedness, diversity and cooperation, this book presents integrative local approaches as convincing examples of possible ways forward. It will be of interest to all scholars, students and activists working in community development, social development, social work and human geography. Susanne Elsen is professor for social sciences at the free University of Bolzano, Italy. She has long-term experience in transformative research, development and training in fields of social and solidarity economy and community-based development in- and outside of Europe. Her emphasis as researcher and activist lies in eco-social development and transformation with a special focus on integrative and participative socio-economic solutions for disadvantaged rural and urban areas.